Since the NBN was connected in Aspley as year ago, there has been good take up from local residents and business owners. Almost 3500 homes and businesses in Aspley have connected to the NBN, leaving an estimated 450 with only 4 1/2 months to jump on board. These areas in Aspley join almost 87,000 other homes & businesses in Queensland where the NBN has been switched on. 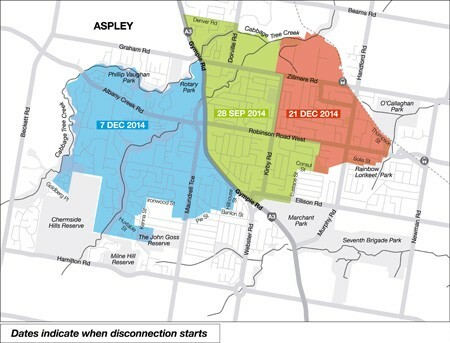 The official Copper Disconnection date in Aspley is 28 September 2014, at which time phone and internet services using the copper network will be permanently switched off and replaced by the National Broadband Network. Even those who do not use the internet will need to switch to the NBN to continue using their landline (fixed line) telephone. NBN Co taking all the necessary steps to ensure residents and business owners in areas of Aspley are well prepared & informed about making the switch to the NBN before the 28 September 2014 copper disconnection deadline. This education & communication campaign includes local advertising, community information sessions and direct mail. Making the switch to the NBN is not a simple process and requires planning and coordination to migrate existing landline phone and internet services. Please Call Us Today to discuss your NBN migration plan.